During my recent tour of the United States with Rahul Gandhi, I was confronted with a plethora of glaring insights, perceptive analyses and provocative questions in my conversations with various leaders, experts, journalists, businessmen, and politicians. Two such insights particularly stuck with me. The editor of a leading newspaper questioned America’s obsession with Russia, fuelled largely by Hillary Clinton’s accusation of a Russian conspiracy that compromised her election, and India’s similar fixation with Pakistan. They pointed out that this fixation is exacerbated by the fact that Russia, and similarly North Korea, “sell” in America, while Pakistan “sells” in India, but in the process, both countries are ignoring, at their own peril, the elephant in the room — China. China has created an economic dilemma by taking away and redirecting blue collar workers to the country, generating a political quandary as a consequence of the dearth of jobs in America and India. The political system in China, particularly its lack of unions, enables it to construct factories quickly and efficiently using coercion, something that the democratic systems of India and America cannot compete with. This is not to say that China should be treated with hostility, but the economic and political challenges engendered by the deficiency of jobs are perhaps responsible for the Trump phenomenon in the first place. The challenge is also a strategic one. Both North Korea and Pakistan enjoy close ties with China, without whose overt support neither would hold any strategic importance in global politics today. For instance, China invests billions of dollars in Pakistan through the China-Pakistan Economic Corridor (CPEC) for modernising its infrastructure by constructing roads, transport networks, power generation facilities and the like. While the development of Pakistan and its consequent stabilisation is strategically beneficial for India, the point that was made to me in the US was that India needs to cease its fixation with Pakistan and instead focus on creating a consistent and sustainable China policy. For India, a transgression like Doka La is far more worrisome than border disputes with Pakistan. The strategic challenge, then, is whether India and America can create an alternative global vision or narrative to, say, an OBOR, which is arguably the embodiment of China’s formidable economic and political strength in the global context. The second analysis was from a strategic affairs expert, who believed that in the entire crescent-shaped belt starting from the Middle East and extending to Myanmar, India is the only buffer country where our 200 million-strong Muslim population is moderate, has a stronger sense of national identity than religious identity, and has thrived because of India’s secular politics. The concern of this individual was that polarisation politics in the country could potentially lead to the isolation or marginalisation of religious minorities, causing a shift from national solidarity to purely religious sympathies, as a consequence of which this moderate patch would cease to exist. His argument was that India’s domestic politics is fueling a national security problem, case in point being Jammu and Kashmir. I made it abundantly clear that this was highly unlikely, given that in India, religious minorities have always co-existed and worked with Hindus cohesively and peacefully, regardless of the politics of the day. While I definitely do not believe in the analysis that we may cease to be a solitary moderate belt in an ocean of radical or extremist nations, it was fascinating to understand and dissect global perceptions of Indian politics. These insights provoke some thought about the nature of debate within the largest democracy in the world and the oldest democracy in the world. 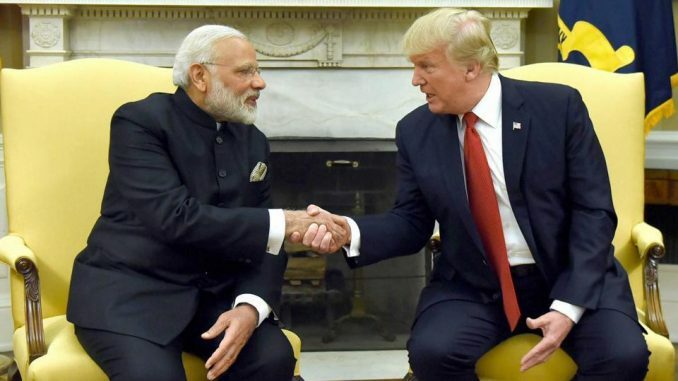 It seems that the domestic politics of India and America often obscure the larger picture, causing us to be rather short-sighted about matters of strategic importance. It goes without saying that I take pride in our democratic system, but I wonder if this short-sightedness is an occupational hazard of flourishing democracies, and if the simplification of nuanced, complicated debates is a democratic tax that we must be happy paying?